The Services page is where you set the cleaning services and pricing that you offer and the fees that you charge. 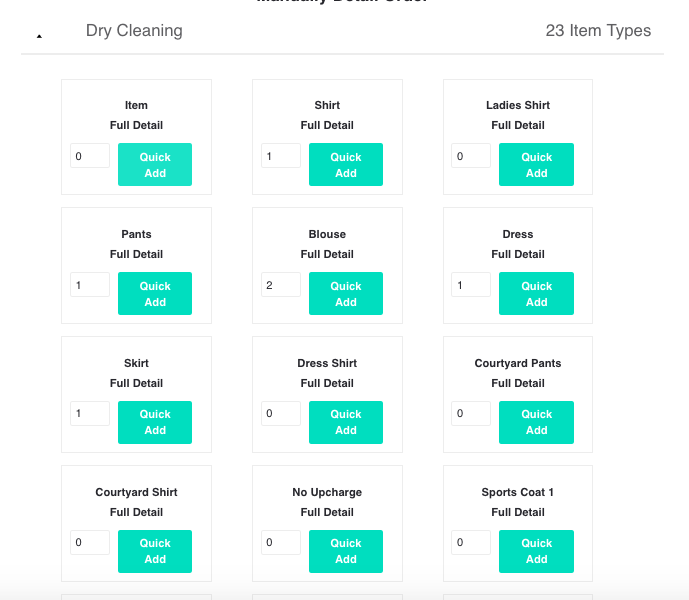 The page is divided into service types - Dry Clean, Wash & Press, and Other - which correlate with the mobile app, as well as the Fees section. Services are what you offer your customer, such as "dry clean shirt" or "wash and fold". There are four categories of services: Dry Cleaning, Wash & Press, Wash & Fold, and Other. Within category are the items. You can organize your items as you like by dragging and dropping them into the proper order. 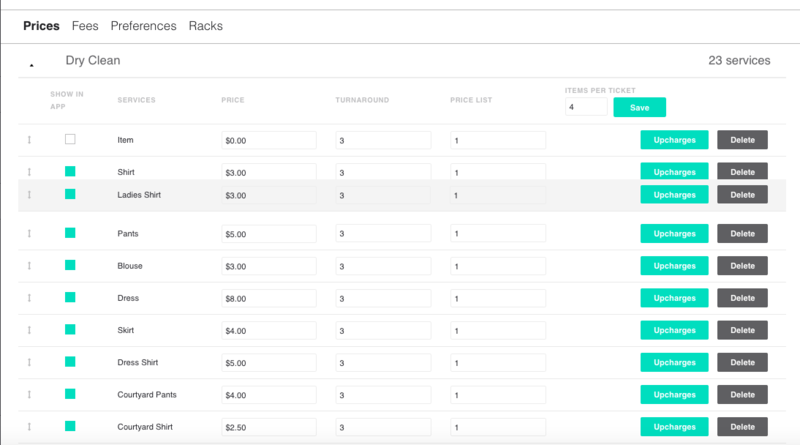 Items will display in the same order on the Full Detail page as they do on the services page. Delivery Fee (Optional) The delivery fee is what you charge each customer per order on top of the individual item pricing. The customer is automatically charged the amount that you set here on every order unless their order meets the Free Delivery Threshold. Same Day Delivery Fee (optional) This fee is applied to any delivery orders which are delivered on the same day as they are picked up (ie. picked up on a Tuesday morning route, and delivered on an evening route that same day). Next Day Delivery Fee (optional) This fee is added to the item total for any orders which are delivered the day after they are picked up (ie, items picked up on a Tuesday and delivered the next day on Wednesday). Tax Rate (Optional) This is where you set your tax rate. The customer is automatically charged the amount that you set here on every order, and the tax amount charged is exempt from your payment processing fee. Free Delivery Threshold (Optional) As noted above, the customer is automatically charged the Delivery Fee that you set unless their order meets the Free Delivery Threshold. If the customer's total item price is above the threshold, they are not charged a Delivery Fee. Minimum Order Price (Optional) This is the minimum amount charged to customers on an order regardless of the total item price. For instance, if this is set to $20 and a customer's item total only reached $15, they will be charged $20. Minimum Laundry Size (Optional) This is the minimum amount of laundry charged to customers on an order regardless of the actual laundry. For instance, if this is set to 10 lbs and a customer only gives 5 lbs of laundry, they will be charged for the 10 lbs. Refer-A-Friend Value (Optional) This is where you set the value of your referral promotion. For instance, if this is set to $40, when a customer refers a new customer to your service and that customer places an order, both the old and new customers receive $40 in credits.